Pakistan's prime minister named a new head of Inter-Services Intelligence, the country's most powerful spy agency and a critical element in the U.S. fight against insurgents in both Pakistan and neighboring Afghanistan. Lt. Gen. Zahir Ul-Islam, who is currently serving as an army corps commander in the region of Karachi, steps into the new post, the office of Pakistani Prime Minister Yousuf Raza Gilani said Friday. 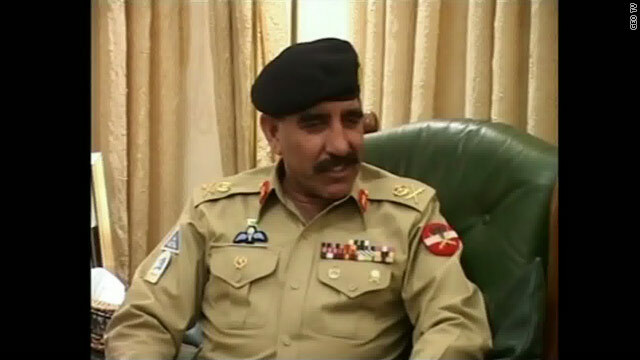 The current ISI chief, Lt. Gen. Ahmed Shuja Pasha, is retiring March 18, Gilani's office said. Islam was in the ISI as a two-star general before being promoted to three-star general in 2010 and being appointed to one of nine coveted corps commander posts. Each of Pakistan's corps commanders oversees a large army formation in a specific part of the country. The appointment has been approved by the head of Pakistan's military, Gen. Ashfaq Pervez Kayani. Kayani submitted three names to the prime minister to select from for the appointment.A spokesman for the Pakistani army would not comment on the matter. "Obviously, the army chief is close to all three of the individuals he recommended for the position, but we don't comment on why he chose those names," said Maj. Gen Athar Abbas, the army spokesman. "This is not a surprise selection," said Islamabad-based military analyst Wajahat S. Khan, who described Islam as a widely respected military leader and a close associate of Kayani. "Islam has been through the ropes, and he's not an inexperienced candidate," Khan said. A U.S. official who was not authorized to speak for attribution said Ul-Islam "is close to Kayani" and has served in key positions in both the Pakistani army and at the ISI. The official also said the new spy chief is familiar with the United States. "During his career, (Zahir Ul-Islam) traveled to the U.S. to participate in U.S. military sponsored training and international fellowship programs," the official said. It remains to be seen how the appointment affects the country's intelligence relationship with the United States. However, the U.S. official said, "We would expect (Zahir Ul-Islam) to continue cooperation with the United States in our mutual fight against terrorism." The United States relies on the cooperation to aid its efforts to target al Qaeda and the Taliban, especially as Pakistan-based insurgents continue to provide critical support and manpower to the insurgency in Afghanistan. The appointment comes as Pakistan is reconsidering its ties to the U.S. government as a whole and its intelligence service after a tense 2011 in which Pakistan was kept out of the loop as U.S. intelligence tracked al Qaeda founder Osama bin Laden to a Pakistani town, flew undetected into the country and killed him. That was followed by the killing of two dozen Pakistan troops when U.S. and NATO forces fired on two border outpost under the mistaken belief they were being attacked by Taliban. In addition, U.S. government and military officials have accused the ISI of aiding and protecting the Taliban. The former chairman of the Joint Chiefs of Staff, Adm. Mike Mullen, accused the ISI of protecting a key Taliban group, the Haqqani network, calling it a "veritable arm" of the Pakistan spy agency. Former CIA Director Mike Hayden said the appointment of Islam could be a fresh start for the U.S. relationship with the ISI. "The U.S. will look at this as a chance to reboot the relationship with the ISI, which has been severely strained over the past year," he said. The strain put a chill on Pakistani cooperation with the United States. U.S. drone strikes targeting al Qaeda and the Taliban were paused for over a month after the border incident but have since resumed. Even with the tension, there continues to be a "back and forth" of information sharing, the head of the Central Intelligence Agency, David Petraeus, said in January. He described the relationship as "strained" and "fraught," but said there continued to be intelligence discussions. The Pakistani parliament is preparing an assessment of the overall U.S.-Pakistani relationship, including the intelligence agencies. That will then be used as basis for the Pakistani Cabinet to advise on how the country should move forward. Washington will look to Islam to support the fledgling talks with the Afghan Taliban leadership, analyst Khan said. "He could play the role of a chief diplomat in the talks with the Taliban," he said. Khan also said he doesn't expect to see an immediate and noticeable difference in the way the ISI operates, but one of Islam's most crucial tasks will be to improve the perception of the shadowy spy agency, both inside and outside of Pakistan. Fantastic items from you, man. I have have in mind your stuff prior to and you are just too wonderful. I actually like what you have got right here, really like what you're stating and the best way through which you say it. You're making it enjoyable and you continue to take care of to keep it smart. I can not wait to learn far more from you. That is really a tremendous website. When did Borat join the Pakistani Military- and who thought it'd be a good idea to promote him to spearhead the ISI? This guy is going to blame "BIN LADEN" WIVES" for the terrorist attacks and make them responsible for all the atrocities committed by Bin Laden. This is Islam's MO and of any Islamist, to blame the weakest link for their incompetence and/or their active collusion with Bin Laden. Spy agency? Double standards? Is CIA a spy agency too oh no that is an intelligence agency correct ? I am for no agencies at all but also no for double standards and hypocrisy. Stop all U.S. aid now. Let India and China step in it's there back yard any how. Stop aid to Israel then. They certainly don't need it. please lets not even suggest that intelligence is in any way associated with this guy or his cohorts. and just how many times does this guy meet with iranians , and the answer to this would shock you , the isi meets with irans guys a couple of times a week now. there is no trust between the west and these guys , it is now just a managed relationship at best.